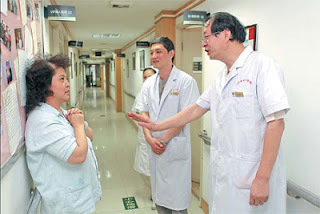 Many Chinese are unhappy with doctor-patient communication. In the wake of the second fatal stabbing at a hospital in six months, many in the public reacted with anger over growing perceptions that China's healthcare institutions are increasingly sites of poor treatment – in the degrading sense. On March 23, a 17-year-old patient named Li Mengnan stormed into the First Affiliated Hospital of Harbin Medical University in China's Heilongjiang Province and attacked doctors, killing an intern named Wang Hao and seriously injuring three doctors. Earlier the same day, Li was diagnosed with tuberculosis and a form of arthritis known as Bekhterev syndrome. The Harbin public security bureau said Li went to the doctor the same morning, and left believing the doctor refused to treat his illnesses. "I told the police that doctors at the hospital had a terrible attitude and deliberately refused to treat me," Xinhua News Agency cited Li as saying. The incident recalled a separate dispute in a hospital which also resulted in a violent stabbing attack. Last September, a 54-year-old man entered the Beijing Tongren Hospital and stabbed a doctor to death. The man accused the doctor of malpractice, after an operation on his throat cancer left him unable to work. In 2010, over 17,000 violent incidents occurred in hospitals, according to China Daily. Health Minister Chen Zhu issued a statement on March 26, called on prosecutors to seek the death penalty for Li. The China Medical Women's Association also condemned the attack, stating that security systems must be upgraded throughout the country's hospitals. However others were quick to question the source of rising tensions in the healthcare system. A poll on the popular microblogging website Sina.com found that 65 percent of 6,616 respondents said they were "happy" about the alleged revenge attack. Several blogs also saw an outpouring of anecdotes related to problems with medical treatment services. Experts say frustration has mounted on the lack of communication between doctors and patients. Chinese Academy of Social Sciences researcher Zhu Hengpeng said such barriers create distrust in the patient-doctor relationship. Zhu added China currently suffers from a shortage of medical professionals and the cost of care remains relatively expensive. For example, Li lived in a poor family with about 1,000 yuan earning per month, but his medical charge has cost tens of thousands yuan. Unfortunately, large portion of the charge is excluded in the health care system. At a memorial for Wang, the chief of the Department of Neurology at Xuanwu Hospital Ling Feng said the tragedy could in part be traced to Li's inability to afford medical treatment.